Rising 1454 feet tall and the tallest building in the world for nearly forty years between 1931 and 1970, the Empire State Building has featured in the imaginations of tourists, immigrants, and New York natives since it punched through the clouds. It has made numerous appearances in movies, tacky souvenirs, and even New York license plates. The building was constructed in a record 410 days at the corner of 5th Avenue and 34th Street in Midtown Manhattan. The site was the original home of the Waldorf=Astoria Hotel. The firm of Shreve, Lamb, and Harmon was tasked with constructing the tower. 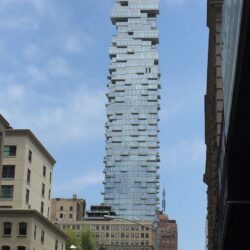 The tower is allegedly patterned off of the then recently-completed Carew Tower in Cincinnati (which also coincidently is the home of the prototype for the Brooklyn Bridge). Over 3,400 workers labored on the structure, which provided needed jobs during the Great Depression. Construction proceeded at such a fast pace and such a precise timetable that workers reported the steel from mills in Bethlehem, PA, was still warm when it arrived. The tower was designed in an Art Deco style and clad in Indiana limestone. Although the building was the tallest in the world, it was not fully occupied until the 1950s, leading it to be called the “Empty State Building.” The observation deck and its broadcasting antenna (added later) proved to be major sources of income for its owners. A well-circulated story about the building’s mast being used as a mooring mast for airships is unfounded–a U.S. military test showed an airship could be anchored, but no one could enter or exit easily. The tower was a sight of tragedy in 1945 when a lost B-25 bomber crashed into the tower between the 79th and 80th floors. Fourteen people were killed in the incident. The tower itself has over two million square feet of usable office space. 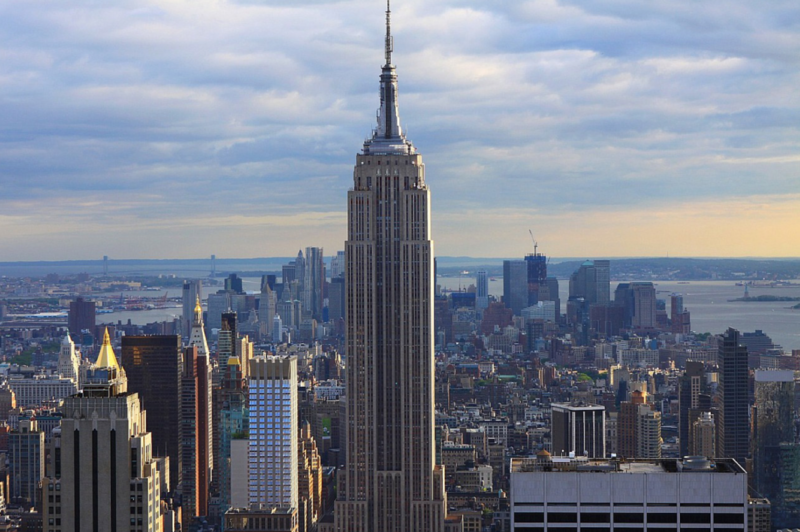 Environmental retrofits over the years have earned the Empire State Building LEED certification. Special occasions have been observed since 1976 with the color of the floodlights of the tower being changed for the occasion. In 2012, LEDs replaced the floodlights, allowing thousands of color combinations. If you are going up to the tower, it is recommended to buy tickets on their site in advance, lest you be subject to lines that will take away most of a day of sightseeing. If you can splurge for it, go to the 102nd floor observation deck to get an incredible view of the city, although the deck is no longer the tallest in the city–1 World Trade Center’s deck is–for now… Many tourists go to 30 Rockefeller Center nearby to get a less crowded view of the city and see the Empire State Building standing proud among the concrete and steel canyons of Manhattan. Even if you do not go up the tower and despite the massive construction boom, you cannot help but see one of New York’s tallest ambassadors from most vantage points in the city. This building’s towering profile and more can be seen on any Sights by Sam tour.